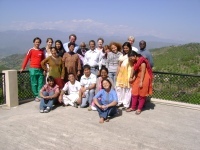 FOSSSIL’s first Linguistics Spring School in the Indian Mountains (LISSIM) was held between 26th March and 6th April, 2007 at Kausani, Uttaranchal. Prof. Anders Holmberg (University of Newcastle upon Tyne), Prof. Ian Roberts (University of Cambridge), Prof. K.A. Jayaseelan (CIEFL) and Prof. Nomi Erteschik-Shir (Ben Gurion University) were the invited faculty for the School. Extensive study along with homework in one’s own language(s) were the highlights of the nine-day School. The study and the homework helped in understanding particular linguistic phenomena in one’s own language(s) better. The topics for teaching and discussion by the respective teachers were: pro, syntax of yes/no questions, split ergativity in Hawrami (Holmberg), Head Movement, clitic movement and climbing (Roberts), remnant movement, stacking phenomena (Jayaseelan) and topic-focus and its various manifestations (Erteschik-Shir). A day-wise break-up of the discussions is given below. The first day of the School started with Holmberg’s class on pro. He started with the null subject construction in Scandinavian languages, referring to his paper in Linguistic Inquiry 36 (2005), Is There a Little pro? Furthermore, Null Subject pros in Finnish that yield a generic interpretation were also discussed. Null Subject pros in Indian languages which have a non-generic interpretation were looked at in the light of this discussion. The post-lunch session started with Roberts’ class on head movement in languages. He gave a holistic account of head movement from different theoretical perspectives. After the tea-break, Jayaseelan started with the Antisymmetry framework of Richard Kayne (1994) and went on to discuss Remnant-VP preposing with extensive examples from Malayalam. The second day started with Erteschik-Shir’s class in which she discussed Topic- Focus constructions and Information Structure in detail with reference to her book Information Structure (see Book View). After lunch, Jayaseelan engaged in further discussion on the theory of Remnant-VP preposing and showed how it can help in explaining preposition stranding and OV word order. In the next session, Roberts focused on how some head movements have LF effects of polarity licensing and negative contraction. In continuation of the last class, Roberts discussed Lechner’s (2005) argument on Semantically Active Head Movement, Matushansky (2006), and Burzio (2006), which showed that head movement is a part of narrow syntax and has LF effects. Further, going into Agree relations and the notion of pied piping, he showed that Structure Preservation Principle and Chain Uniformity Conditions do not support pied piping of the Goal (phrase movement) but the A-over-A condition and Rackowski and Richards’ (2005) view of closest Goal showed that movement of head (Goal) and the GoalP are allowed. He further discussed Marantz’s idea of minimal phase and defective goal. Later, Erteschik-Shir detailed an account of Focus structure, discussing Focus in general along with its types and effects and its relation to stress, topic, etc. After tea, Holmberg, in continuation of his discussion over null pronominals, gave a full account of the typology of Null subject languages with extensive examples from Finnish and showed that generic interpretations are possible in some languages where there is no D feature in T.
In this session, Jayaseelan showed the derivation of the focus position above the VP where nothing can come in between focus position and VP. He also discussed VP vacating movements in OV languages whereby, all the elements move to the left of VP and focus position. He also discussed about anticipatory stacking where a later movement to spec of TP takes place. After lunch, Holmberg started with Yes/No questions, giving examples from Finnish. The syntax of the positive and the negative replies differ in terms of their typology whether they fall into the Y (answering in ‘yes’) and V languages (answering in “speaks”). He showed that the derivation must locate a Polarity phrase above the TP for the replies of the yes and no questions and also how this relates to Topic and Focus. Erteschik-Shir discussed the interaction between Focus Structure and phonology and word order phenomena. After lunch, Roberts first discussed complement clitics in Italian and diagnostics relevant to them. Then he went into the notion of Defective Goal and showed how it explains cliticization. Clitic-climbing with restructuring verbs and the causative paradigm were also discussed during this session. Erteschik-Shir took over after the tea-break and discussed focus structure and PF interpretations, constraints on focus structure, epistemic verbs, canonical and non-canonical focus structure, wh-topic, completing a fruitful first half of the school. Excursion to Chaukhori to enjoy the view of yet another range consisting of Annapurna – the third highest peak in the world. The group also had a special and memorable bonfire night during this trip. Continuing with Causative paradigms, Roberts discussed causativizing transitives and Collins’ (2005) Smuggling account of passives in this relation. He further discussed subject cliticization, analytic and synthetic causatives. The post-lunch session saw Holmberg take up Ergativity of Hawrami as in syntactic and morphological ergativity, and the paradigm of clitics, especially subject clitics in Hawrami. The derivations made crucial use of a VoiceP projection above vP. Further he discussed passive of ditransitives and possessive raising. After tea, the discussion centered on the relation of topic-focus with special reference to the status of superiority condition in Hebrew. Roberts discussed the difference between proclitic and enclitic, periphrastic tense, fare-infinitive (FI) construction in Italian causatives and faire-pas (FP) constructions in French. He went on to discuss verb-movement in terms of cliticization and incorporation and showed how it can be explained in terms of the notion of defective goal and how cliticization is similar to aux-movement. German and Romance inflectional systems proved to be instrumental for this to be a narrow-syntactic operation and have LF effects. Discussing the French-English V-Adv distinction and using the notion of anticipatory stacking, Jayaseelan discussed about the position of adverbs in English and French; disjunction in English derives the ForceP in place of FocP as they are syncretic in English. After lunch Roberts, continuing with verb-movement in VOS and VSO languages, explained how these are narrow-syntactic processes. Talking about incorporation, predicate clefting and long distance dependency, he argued against extension condition, locality etc., concluding that head movement should not be eliminated from narrow syntax. The students consisted of research (M.Phil. and Ph.D.)students, Linguistics students and teachers from University of Delhi, Jawaharlal Nehru University (Delhi), CIEFL (Hyderabad), Tezpur University (Assam), and University of Trieste. Data and constructions from at least 15 languages from 10 different language families were discussed during this period. They are: Assamese, Bangla, Danish, EkeGusii (a Bantu language), Finnish, French, Hawrami (a Kurdish language), Hindi, Indian Sign Language, Italian, Khasi, Malayalam, Manipuri, Sindhi and Vietnamese.